Exciting news! I am returning to the largest gem show in the world, in Tucson, Arizona. You can take advantage of my 'personal shopper' service; I have access to suppliers from all over the world, to get you all things gems ... sapphires, rubies, tourmaline, diamonds, garnets, sunstone, morganite, beads, pearls, druzys, and even geodes. 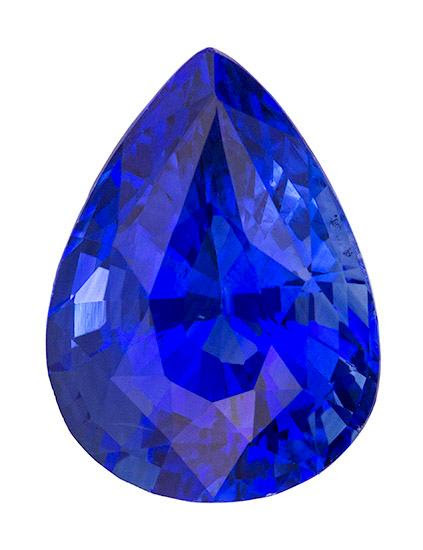 Gorgeous pear-shaped sapphire - can I pick one up for you in Tucson? I already have orders for a sapphire that will be used in a pendant, a matched pair of pearls to go with a client's previously-purchased pendant, and some mint green African garnets to complete a suite of pendant, earrings and bracelet. I just found out today another long-time fan wants a simple, tasteful ring highlighting a single round ruby. I'll get the ruby and we'll work on the ring right after I return. By starting from scratch with unique, one-of-a-kind gems, we are shaping memories and creating personal expressions, not just making jewelry. That's the beauty of custom design, you can be personally involved in marking special occasions, getting exactly what you want, creating meaningful symbols that represent your life and loves. I've called these pieces amulets before, it's a good term to use to describe something near and dear to your heart. In my book "amulets" can be pendants, but they can also be a ring, earrings, even a bracelet. It's an expression of you, in whatever form you want it. Besides gems that you can wear, I also have orders for geodes to enhance personal spaces. I'll take pictures direct from the show, send them to you, you choose what you like, and I'll have them packed and shipped right there at the show. Don't worry if they're large, we can handle it. Thank goodness for smart phones, they make my life and yours so much easier! And thank goodness for UPS! You can give me a budget, and I'll shop for you, finding the items that fulfill your desires. You can be an innovator, wow your friends and family by sharing your story with them. They'll recognize your very personal expression and style. I know I told you a little bit about diamonds last month, and promised more. With all this news, I will have to continue that discussion in March.